This large district occupies most of the West of Paris, extending east-west between the bends of the Seine from the Jardins of Trocadero immediately facing the Eiffel Tower to the expansive Bois du Boulogne (which occupies a larger part of the 16th's territory), and north-south from the Etoile to the southern border of Paris. It is known to be the residence of choice for affluent Parisians, and for hosting numerous internationally famous events, such as the Roland Garros French Open tennis tournaments, as well as the home stadium of the Paris Saint-Germain football club. 9 traverses the 16th north-south, with stations between Alma-Marceau and Porte de Saint-Claud falling within the arrondissement. 48.8622172.2882471 Palais de Chaillot, Trocadéro 6 9 . Great perspective on the Eiffel Tower and Left Bank from Place du Trocadéro in between the two buildings of the palais. Former location of the Palais du Trocadéro. It accomodates three museums, an aquarium, and the Theatre Nationale du Chaillot. 48.877692.268763 Musée en Herbe, Jardin d'Acclimation, Bois de Boulogne (Les Sablons 1 ), ☎ +33 1 40 67 97 66. Daily 10:00-19:00. With a teaching style based on fun and humour, the Musée en Herbe offers classes and games about art especially designed for children. Observation, imagination and identification games permit kids to discover the works of art and objects shown, at their own pace. The exhibits are all hands-on so kids can have a free reign in the museum, and if that's not enough there are workshops as well. €4 for the exhibitions, €8 for the workshops, but add €2.70 for entrance to the garden. Some discounts are available. 48.8641672.2972224 Palais de Tokyo (Site de création contemporaine), 13, avenue du Président Wilson 75116 Paris (Iéna or Alma Marceau 9 ), ☎ + 01 81 97 35 88, e-mail: accueil@palaisdetokyo.com. W-M 12:00 - 00:00. The Palais de Tokyo is Paris's largest specialist contemporary art exhibition venue, owned and operated by the national government. The building dates to 1937 and also includes the Museum of Modern Art of the City of Paris. €12 adults, €9 concessions. 48.87752.26305612 Jardin d'Acclimatation. The northwest corner of the Bois de Boulogne is occupied by the oldest operating amusement park in the world, the Jardin d'Acclimatation, which is mainly known for offering a wide range of amusements which are appropriate even for very small children. They have miniature roller-coasters for children as small as three years, and the usual range of pony rides etc. 48.85192.265314 Villa La Roche, 10 Square du Docteur Blanche. 48.85192.2652815 Villa Jeanneret, 8 Square du Docteur Blanche. 48.8433862.25129416 Immeuble Molitor, 24 rue Nungessor & Coli. 48.8647222.2508331 Bois de Boulogne. A park along the western edge of the 16ème arrondissement of Paris, near the suburb of Boulogne-Billancourt. The Bois de Boulogne has an area of 8.45 km2 (3.26 sq mi), which is 2.5 times larger than Central Park in New York, and 3.3 times larger than Hyde Park in London. 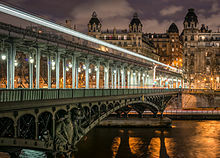 At night time, the area welcomes a different scene, and becomes one of Paris' most prominent red-light districts. 48.863692.287241 Carette, 4. Place du Trocadéro (Metro Trocadéro), ☎ +33 1 47 27 98 85. This Pâtisserie and Salon de thé also has great food. The salads are amazing, and there is delicious cakes for dessert. Big salads at €15. La Gare Chaussée De La Muette. 48.85842.28762 L'Astrance, 4 rue Beethoven, ☎ +33 1 4050 8440. 3 Michelin stars. Considered one of the best restaurants of Paris. Do not go there, if you are hungry and want to get full. 48.869092.289171 Best Western Hotel Victor Hugo, 19 rue Copernic, ☎ +33 1 45 53 76 01, e-mail: paris@victorhugohotel.com. 48.8532.275933 Hotel Eiffel Kennedy, 12 Rue Boulainvilliers, ☎ +33 1 45 24 45 75. Small three star hotel (33 rooms). ~€150. 48.858672.282694 Hôtel Gavarni, 5 Rue Gavarni, ☎ +33 1 45 24 52 82, fax: +33 1 40 50 16 95, e-mail: reservation@gavarni.com. In the heart of the Passy village and its fashion boutiques. It's the first independent hotel in Paris to have been awarded the European Ecolabel. Fully air-conditioned, free WiFi. 48.865222.285666 Hotel Longchamp Elysées, 68, rue de Longchamp. 3-star boutique hotel. ~€150. 48.869832.297267 Hotel Keppler, 10, rue Kepler, ☎ +33 1 472 06505. In the entertainment district with 34 guestrooms and 5 suites. A winter garden and bar is available within the hotel. €125-250. 48.8710242.2933088 Peninsula Paris, 19 Avenue Kléber, e-mail: ppr@peninsula.com. Opening in 2014, the meticulously hotel, known before the Second World War as the Hotel Majestic, has 200 rooms including 24 suites in this 19th century classic Haussman building. 48.86712.28579 Renaissance Paris Le Parc Trocadero, 55-57 Raymond Poincare, ☎ +33 1 44 05 66 66. A quiet small hotel with a courtyard north of metro Victor Hugo. Wired internet at rooms. Rooms at €400. 48.844852.2524610 Hotel Molitor - MGallery Collection, 13 rue Nungesser et Coli, ☎ +33 1 560 708 50, e-mail: H7326@accor.com. The Piscine Molitor swimming pool complex, featured prominently in the book and film The Life of Pi, has been pretty much dismantled and rebuilt after many years of decay, becoming reborn triumphantly in 2014 as a luxury hotel, a part of the MGallery Collection. From €340. This district travel guide to 16th arrondissement is a usable article. It has information for getting in as well as some complete entries for restaurants and hotels. An adventurous person could use this article, but please feel free to improve it by editing the page. This travel guide page was last edited at 14:25, on 28 January 2019 by Wikivoyage user Ibaman. Based on work by Wikivoyage users Hiàn, Traveler100bot, ARR8, Ground Zero, Traveler100, Wrh2Bot, Renek78 and Matroc, Wikivoyage anonymous user 194.66.229.8 and others.